This amazing safari caters for those who are not fussed about the frills of a luxury safari but still would like to enjoy the magic of the Kruger National Park. You will be accommodated at a lodge near the Kruger National Park, savor delicious meals, and enjoy amazing open vehicle game drives escorted by a professional guide. With a 98 percent success rate on all of the Big Five viewing, this safari will be an unforgettable adventure in your life! You will be staying at nKambeni Safari Lodge or similar. There will be a meet and greet at your place of accommodation or at O.R Tambo International Airport, then you will be transferred to nKambeni Safari Lodge. The drive of approximately five hours will take you across the Highveld and down the Schoemans Kloof Pass through the town of Nelspruit and White River to the lodge just outside Hazyview inside the Kruger National Park. Upon arrival, you can enjoy a swim in the pool before the sunset game drive in open vehicle in the Kruger National Park. 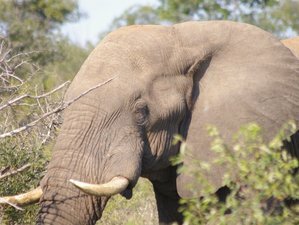 You will enjoy a full day open vehicle game drive with the experienced Kruger guide in the Kruger National Park. The Kruger National Park can offer a 98 percent success rate in seeing all of the Big Five but this is of course never guaranteed. Lunch will be on your own account at the Lodge before continuing through the afternoon. You can opt for an optional morning game drive or the Panorama Route tour on your own account before the return trip back to Johannesburg. South Africa comes from a long history of colonial venture and racial history dating back to the early 1800’s and before to the early Portuguese settlers. It can also be said that South Africa over the years has united into one “rainbow nation” that boasts itself as being the economic hub of Africa and the most sought-after travel destination in Africa. South Africa has it all, from deserts, pristine beaches, rugged mountains, wetlands, woodlands, nature reserves and adventure sports, as well as the smallest back town, large cities, and not to forget, the Table Mountain in the fairest Cape. The Kruger National Park covers 19,500 square kilometers which is the second larger game park in Africa and the largest in South Africa. The Kruger National Park spans 360 kilometers from north to south and 65 kilometers from west to east. The park holds the Big Five which is a dream come true to any avid game watcher and wildlife enthusiast. For the avid birdwatchers, this place can be simply described as pure heaven. All breakfasts and dinners will be served at the lodge. Meanwhile, lunches will be on your own account. Furthermore, in order for Adventour to properly cater while on tour, it is important to inform Adventour if there are any special dietary requirement. Please book your flight to for an early morning arrival at O. R. Tambo International Airport (JNB).